As one of the fastest growing communities in the nation, Chandler, a suburb of Phoenix, AZ, has transformed from a small agricultural town at the turn of the 20th Century to the High Tech Oasis in the Silicon Desert of today. Chandler, AZ In 1891, Dr. Alexander John Chandler, the first veterinary surgeon for the territory of Arizona, bought 80 acres of land from the federal government south of Mesa in the Salt River Valley. Dr. Chandler studied the relatively new science of irrigation engineering and was instrumental in building an early system of canals in what was then an arid desert. The town then consisted of three wooden shacks — the townsite office, a dining hall and the Morrison Grocery. There was also a billboard marking the site of the elegant future Hotel San Marcos. Dr. Chandler had an ambitious plan that was well ahead of his time. He envisioned a landscaped central park that would be surrounded by businesses. The walkways in front of the buildings would be covered by a trellis-like roof, supported by colonnades. Deed restrictions required land owners to build on their land within one year. But agriculture was still the big business in Chandler at the time. Cotton, grains and alfalfa were the primary crops. Farmers also raised cattle, sheep and, yes, ostriches. Ostrich feathers were used to adorn popular women’s fashions. Top quality feathers sold for as much as $250 a pound. 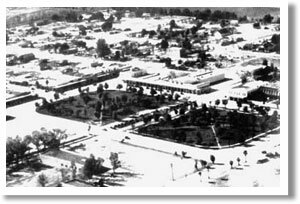 By 1920, Chandler had more than 1,000 residents. Automobiles had become the main form of transportation, so the town’s roads needed to be paved. The water and sewage systems were also outdated and the utility services were unreliable. Arthur Price, the local Justice of the Peace, drafted the town’s first charter, and in May of 1920, the citizens voted to incorporate and become the Town of Chandler. Dr. Chandler agreed to serve as the first mayor until one could be elected. They soon after elected a mayor and council. The Great Depression was not a devastating experience for most of Chandler’s residents. The cotton crash of 1920 had a far greater impact on the agriculturally based economy. Dr. Chandler, however, did not fare so well during the depression years. The Bank of Chandler collapsed and he lost the San Marcos to his creditors. He was able to retire comfortably, though, and lived in a cottage on the grounds of the hotel. By the late 1930s, Chandler was experiencing some problems spurred by growth and technology. Drivers of the new faster cars sometimes didn’t realize that Arizona Avenue then ended at the town plaza. Cars often jumped the curb and drove right into the park. And the large diesel trucks that made deliveries to businesses around the park had trouble navigating the narrow roads around the plaza. In 1940, the state proposed to align Route 87 down Arizona Avenue. Residents were not happy to see their beautiful park divided in half for a highway, but the town’s original design was no longer safe or practical. During World War II, Chandler’s population doubled and reached 3,800 by 1950 — the year Dr. Chandler passed away. On May 24, 1954, the status of Chandler was upgraded from town to City. In recent years, Chandler’s borders have been expanded and the population has boomed — from 30,000 in 1980 to more than 240,000 today. The economic base of Chandler has been diversified. While agriculture is still somewhat of a vital element, Chandler now enjoys a strong manufacturing and electronics sector.